Sony to offload TV and mobile phone division? | What Hi-Fi? Sony to offload TV and mobile phone division? Sony proved to be one of the busiest manufacturers over at CES 2015 in Las Vegas, with a whole host of new products unveiled – including 12 brand-new TV ranges and the NWZ-ZX2 Walkman. 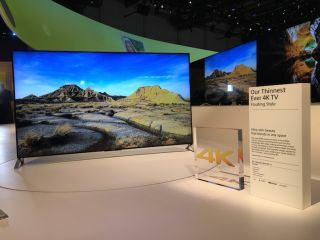 Among the products that made a first appearance was the X90C – said to be the world's slimmest 4K Ultra HD TV. And it was an indication that Sony is eyeing up a big year when it comes to TVs. But new reports have suggested the Japanese tech giant might not be in the TV sector for long, with the company said to be weighing up its options with regards to its TV and mobile phone operations. Sony is shedding a significant amount of cash as its mobile division struggles under the weight of competition from the likes of Apple, Samsung and others. Its TV division is also under pressure as TV margins shrink and replacement cycles lengthen. The increasing prevalence of supermarket special TVs and affordable options from China don't help matters, either. Reuters has now reported that CEO Kazuo Hirai is open to the idea of selling off both the TV and mobile phone wings of the corporation, in addition to establishing new joint ventures. And according to one source who spoke to Reuters, Sony's management has recognised that "no business is forever" and that "every segment now needs to understand that Sony can exit". Hirai was also quoted as telling reporters at CES 2015: "Within [electronics], there are some operations that will need to be run with caution - and that might be TV or mobile, for example." The Japanese tech giant is expecting to post a loss of £1.3bn for the year ending 31st March, and that's despite the Award-winning success of its flagship smartphones and its most recent TVs. Our 2014 Awards saw the Xperia Z3 pick up the prize for Best smartphone 5in+. Meanwhile, there were accolades for the KDL-40W605B and KDL-32W706B in the TV category as well.